Adorable cottage making up part of a small partially inhabited village and boasting a large private garden area, offering both sun and shade. 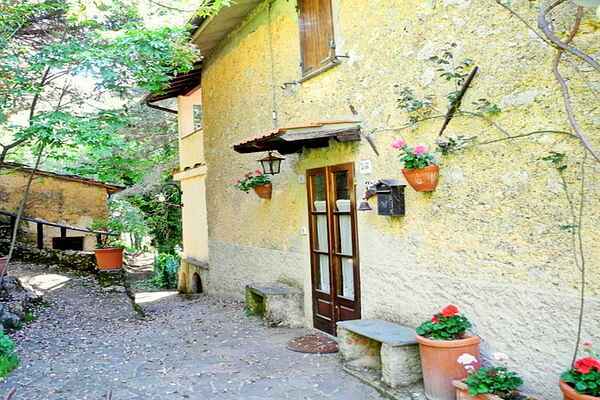 This rustic property, with its warm and welcoming interior, is located at the very top of the Camaiore valley, above the town of Casoli, renowned for its murals. The land around the house is hilly and there is plenty of nature. The setting is predominantly verdant with walking paths and splendid views with mountains as a backdrop. Heating is provided by a stove with gas canisters. In the cooler months can be expensive. It is recommended to use together, or alternatively the fireplace. Casoli is located 403 meters above sea level, nestled on the foothills of Mount Matanna, divided into two "villages" named "Mandria" and "Carubola". Perched on the right bank of the river Lombricese, is inhabited as early as 984. From the village square you can admire the beautiful scenery of the southern peaks of the Apuan Alps. Just above the country begin the paths leading to the M. Matanna and M. Prana. Known for its famous murals that appear from time to time along streets and walls. For lovers of tracking, mountain biking or hiking numerous trails that depart from the vicinity of the dwelling and marked on the maps that will be provided upon arrival. The beaches are located about 15-20 km and can be reached in 30 minutes. To save time it is advisable to avoid times of traffic from 7.30 to 08.30, from 12.00 to 13.00 and in particular in the evening from 18.00 to 19.30. Viareggio: free beach, in Viale Europa.